A-006 In service with Echelon-07, 15/4/2004. Active Protocols: A-006 is to be contained within a standard humanoid containment chamber at Site-014 As of 27/9/2000, due to Its anomalous properties, A-006 was allowed to, and has, joined the Echelon-07 division of the Initiative Security Forces. A GPS tracking device has been implanted in A-006's neck. If A-006 strays too far from Echelon-07 Personnel, NDI Personnel are to track down and temporarily contain A-006. However, the aforementioned scenario has not occurred. A-006 is anatomically identical to a non-anomalous human female from the age range of 23-27. Although not the best in these regards, A-006 contains more notable strength, agility, and endurance when compared to the average human female. A-006's anomalous properties manifest when A-006 is fatally injured. Upon the neutralization of A-006, A-006 will re-manifest in the location it was last sighted in. This process is theorized to work via a form of a localized time loop. Further evidence to support this theory is the fact that A-006 does not age. A-006 can also reanimate organisms when neutralized, although strict conditions must be met for this process to occur. A-006 can not properly replicate inanimate objects via this method, however. Addenda-006-A—Discovery: A-006 was discovered on 26/█/1999, when A-006 was shot fatally by accident during a military exercise outside of Amiens, France. A-006 re-manifested 5 seconds later, completely unharmed. The French Army contacted the New Dawn Initiative, who contained A-006 at Site-014. Adrien Molyneux, the leader of the Echelon-07 division, recommended that A-006 join Echelon-07 after testing with some limitations. Procedure: A-006 was given an NDI FAMAS-A3 and was told to run the NDI CQB operatons course. The course involves multiple simulated combat scenarios. This test was observed by Colonel Adrien Molyneux. Results A-006 loaded its rifle and started running. A-006 shot all the initial targets in 3.2 seconds, and continued to move. The next part of the course featured a simlulated "Assailant" D-class holding an unloaded USP service pistol to the head of Researcher Dimitrov. A-006 fired at the D-class personnel's head, killing him instantly. A-006 eventually completed the course in 50.5 seconds, meeting the requirements for NDI service. Procedure: A-006 was assigned to sit completely motionless in a standard test chamber, while various fatal hazards appeared. Results A-006 was shot with low caliber firearms, mirroring the anomaly that lead to A-006's discovery. A-006 was neutralized, re-manifesting 5 seconds later. The same procedure was repeated with various hazards, including knives, explosives, large caliber firearms, poison gas, and incendiary weaponry. A-006 re-manifested from all tested variables, with times recorded from 5 to 45 seconds. A-006 was later re-contained, and the results were forwarded to Colonel Adrien Molyneux. Colonel Adrien Molyneux, Looking over the data recovered from both tests, asked for the approval of the NDI leadership to recruit A-006 into Echelon-07. Molyneux arrived at A-006's containment cell, paperwork in hand. A-006 had accepted the interview as soon as it was proposed. Foreword: The following is the Interview between Echelon-07 Colonel Molyneux and A-908-D recorded at A-908-D's containment cell at OL-Site 908. Since the conversation originally happened in French, it has been translated into English. A-006: "My name? It is Nadia Vallotton, Colonel." Molyneux: "That is where you are wrong, Nadia. 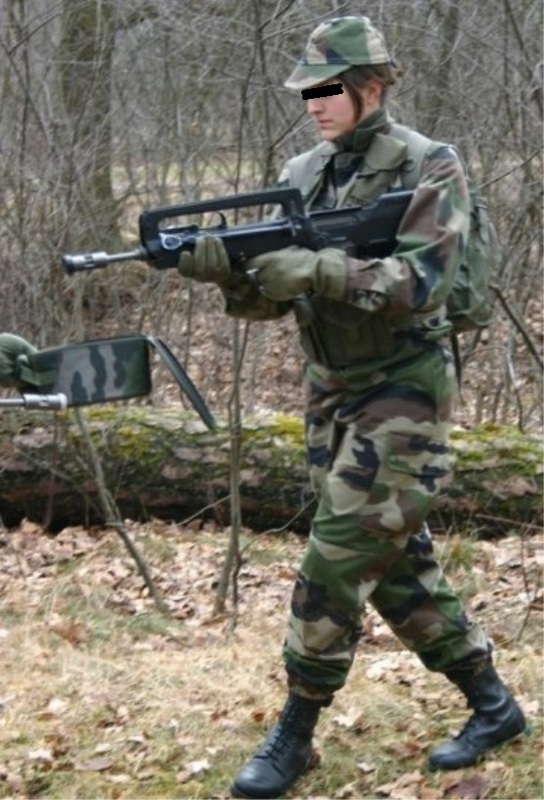 I lead Echelon-07, A division in NDI's ground forces composed entirely of French speaking combatants. Would you be interested in joining?" A-006: "Yes. Of course. What's the catch?" A-006: "I would be willing to do that. After all, My, well, oddities, lead to me being a good soldier, no?" Molyneux: "Precisely. Now, Let me ask one more time. Are you willing to fight for Echelon-07? I would say you would be putting your life on the line, but, not really in your case." A-006: "I see that paperwork in your hands. Just give it to me and I will sign." From there, A-006 signed the paperwork provided by Colonel Molyneux, and 4 hours after the interview, A-006 received the GPS tracker implant and was officially conscripted into Echelon-07. Procedure: A-006 was assigned to sit completely motionless in the barracks of Echelon-07. A-006 was assigned to hold 4 different items, while it would be neutralized by small arms fire 4 times. Rat (Deceased via artificial means) Upon A-006's re-manifestation, an exact clone of the rat, although alive, appeared in the same spot pre-neutralization. Rat (Deceased via natural causes) Upon A-006's re-manifestion, the rat had re-manifested, but it had not re-manifested alive. Approximately 20 minutes later, the rat appeared to reanimated, only to burst into flames and die again another 20 minutes later. HK USP service pistol Upon neutralization of A-006, the USP was dropped. Upon A-006's re-manifestion, a copy of the USP was created. This copy was later fired, and after doing so, disintegrated into what appeared to be sand. The “sand” then reformed into another copy of the USP, which appeared to have the consistency of modeling clay. 5 5.56x45mm NATO cartridges Like the previous test, A-006 dropped the cartridges upon neutralization. Only one exact copy of an 5.56x45mm cartridge was created upon A-006's re-manifestion. However, none of these cartridges were operable, with the only functional cartridge exploding in the chamber of the NDI-FAMAS-A3 it was loaded in. Three of the four other cartridges that had manifested were made of wood, gallium, and plastic, and were not fired. The final cartridge manifested was a 7.62x39mm cartridge, which was later found to be fully-functional.